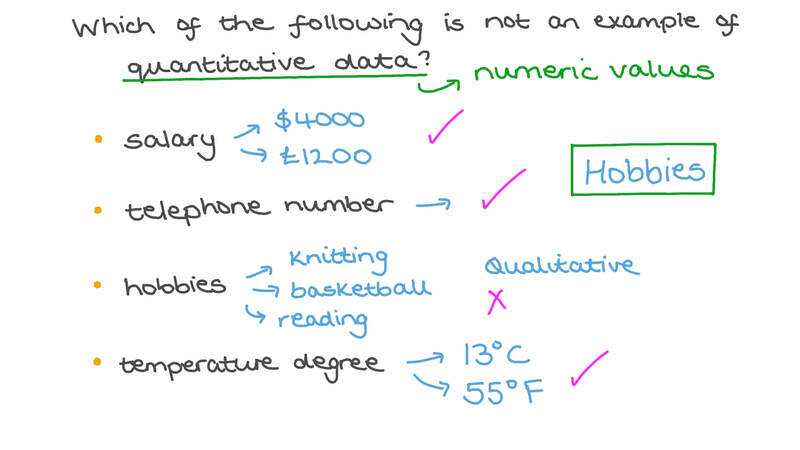 In this lesson, we will learn how to distinguish between categorical and quantitative variables. Which of the following is not an example of quantitative data? Is date of birth an example of quantitative or descriptive data? Which of the following categories represent quantitive data? Is age an example of quantitative or descriptive data? Is the price of a television an example of quantitative or descriptive data? Is length an example of quantitative or descriptive data? Which of the following is classified as quantitative data? Is weight an example of quantitative or descriptive data? Is a house number an example of quantitative or descriptive data? Is height an example of quantitative or descriptive data? Is date an example of quantitative or descriptive data? Is the temperature an example of quantitative or descriptive data?